The Ghosts of Revolution? The Yellow Vests Rise Up against the Totalitarian Financial Empire. Elated, with the single-mindedness of the “We” of the many, suddenly aware of its power, the crowd pours out of the narrow street in which it was crammed, to the spacious Place de la Republique while singing the Marseillaise. It is by far the most popular song among Yellow Vests. The second most popular is the WWII partisans’ song (Chant des Partisans), though with slightly changed lyrics. Now the song calls for the “toothless”, the “illiterate”, the “slackers”, the “stubborn Gaullois”– as Macron and his servants called the people who refuse to embrace his “reforms” – to rise against the Financial Elite, sparing not tears and blood, just as the French patriots did when they fought against the Germans. Occasionally you can also hear them singing the Internationale, which, anyway, was an adaptation of the Marseillaise. Originally the song of the French Revolution, La Marseillaise is now the official national anthem of France. It calls “les enfants (the children) de la patrie”, the “citizens” to “take up arms” and raise the “bloody banners” against “tyranny” as the “day of glory” has arrived. 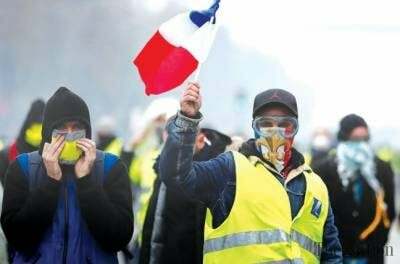 There is a one dominant analogy which is drawn, indirectly but explicitly by all – whether by discussing with representatives of the French establishment or by watching the Yellow Vests’ demonstrations or by listening to the slogans and songs of the protesters here in France, the analogy is strongly felt throughout the last three months during which this original movement, despite the unavoidable fatigue, continues its mobilizations, taking by storm the French rural and peri-urban areas, several provincial cities, while now it also attempts to penetrate the “Suburbs”, the forts of the French working class. The inescapable comparison which appears in a variety of forms, be they planned or spontaneous, is the Great French Revolution of 1789. Its ghosts seem to haunt the French and their country. Whether it is because they want to dispel its notion or draw inspiration from it, I am not sure, but in the end, this is the analogy which, one way or another, is drawn by everyone; both the demonstrators and those siding with the government. Anyone who wants to make a political argument sound convincing in today’s France, is rushing to “borrow” a character or a symbol of 1789. “You’re like Mirabeau” a “leftist” critic said lashing out at Mélenchon the other day, accusing him of being overly compromising. Either through symbols and historical analogies or collective memory, the memory has been passed down through ten generations of the French people. The mother of Europe and modern Democracy faces now up to its past, in search of its future. France, all of its classes – save perhaps for the English-speaking managers of French multinational corporations and some extreme neo-liberals and neoconservatives who are ashamed of their country’s history – remains inherently proud of its Revolution, even if it shudders at its memory. Although the Marseillaise announces the coming of the day of glory, for the time being, it is only the “hour of tear gas,” as canisters hellishly rain down upon the demonstration as it leaves the Place de la Republique. “Damn you” I say, talking to myself, having spotted Eric Drouet, the lorry driver who became a “star” of the Vests’ movement, but unable to catch up to get an interview with him. I was caught in the rampage which scattered the crowd, some of us fleeing to refuge and others pushing on. Drouet has a few hundred thousand followers on his Facebook page and is now becoming as difficult to talk to as it is to talk to the Prime Minister. But the tear gas these days in France is no joke. There are many who started their day that morning with both their eyes and arms ending in the evening in a hospital one of these appendages missing. The police’s crackdown is of course a double-edged sword, having already been condemned by Amnesty International, law experts and government MPs. On the one hand, it discourages some people from joining the demonstrations but on the other it inspires anger. At the same time, police officers seem to have reached their limit, having spent days and nights in the streets over the last three months, counting injuries without getting paid overtime in order to suppress the demonstrators, among whom they might find their own wives!